Do you supply your machines Worldwide? Absolutely. We are proudly a British Company and currently, our largest market is no doubt the UK. However, we feel that our machine is well manufactured and extremely well priced - so much so, we are getting a very regular stream of enquiries from around the world. We are well geared to shipping overseas - we have been doing this successfully for over 30 years! With us, there is no waiting as we keep large stock of machines for prompt despatch. Our machines are well packed and fully insured. So, wherever you are in the world, we can help you and deliver your machine, right to your door, often within just five working days from receipt of payment. Is it easy to order from you in the UK - I have never imported anything before? It is very easy to order from us. You simply tell us what you require, we email you a pro-forma invoice (along with our bank details) showing the amount that needs to be paid inclusive of shipping. You get your bank to pay us in British Pounds and we ship. It really is as simple as that. We have been trading internationally for 30 years now and have everything perfected so our customers receive their goods with the minimum of fuss. Please note that the customer is responsible for any local charges, which is only often a few percent of the value of the goods. If unsure, please check with your local Customs Office. To see quick comparisons between the Foilcraft 4x3 and the Foilcraft Junior, please click here. Will the Foilcraft 4x3 & the Foilcraft Junior work in the USA? Absolutely. Our Foilcraft machines will work in the USA, UK and anywhere else in the world. We will supply you with a machine that will work either in 110v or 220v depending on your request. What is the warranty on the Foilcraft 4x3 and Foilcraft Junior? The warranty on our machines is 12 months back to base. However, as our machines are very robustly built, thankfully, they will not fall apart. We use high quality electrical components - however, should any of them fail, we would send you a replacement one by post, which you then must then ask a qualified electrician to replace. Our warranty is for parts and not labour. If you should decide to send the machine back to us for repairs whilst under warranty, then there will be no parts or labour charges involved. Do I require any Training? Hot Foil Stamping is a very simple process. With your purchase, we will supply you with a Instruction Manual with lots of colour images. We will also supply you with a free Training DVD which lasts over 2 Hours and 30 Minutes. The DVD is divided into categories and you will be supplied with a written sheet which will advise you where to advance to on the DVD to get to your preferred topic. Many have found this to be of great help. Please click here to look at our customers reviews. How thick a product can I print with the Foilcraft 4x3 and Foilcraft Junior? Can I print in the middle of a book or a cover with the Foilcraft 4x3? The Foilcraft 4x3 is one of a very few machines that allows you to print in the centre of for example paper that is of the following sizes:- Letter, A4, Legal, Executive and Tabloid. For example you can easily reach out to about 6.5” or as much as 9”-11” with the free ‘Extenders’ which we supply with each machine. This distance is known as ‘Throat Depth’ and most machines do not have the flexibility to reach out so far unless you of course spend 4-6 times more than the price of the Foilcraft 4x3. The Throat Depth for the Foilcraft Junior is 4”. Can I print in other foreign languages too? Certainly! If you are using Metal Type, you can often buy special letters with accents as used in other European Languages such as Spanish, French etc. Alternatively, if you getting a die made, you can incorporate the special characters within your artwork which you would create on your computer. If you have any foreign fonts on your computer, you can get a die made in any language and thus print in any language! Can I make my own Dies at home? Whilst you cannot make metal dies at home due to the corrosive chemicals used in their production; you can however make your own Polymer Hot Foil Dies at a fraction of the cost. These are not metal dies but a special type of plastic which can withstand very high temperatures thus making them very suitable for hot foil stamping - click here for details. Please note that polymer dies are not suitable for debossing or deep stamping. Is the foil printing process dry? Absolutely! It takes just a second or so to print and the product can be handled immediately after printing. We do not use any ink with foil printing as the colour of print is actually dictated by the colour of foil we use - eg. Metallic Gold, Metallic Silver, Metallic Red etc. You can also buy foil in multi-colour finish as well as holographic. Not many know this, but you can also print foil on top of foil to create some stunning effects! Will the foil or print come off at all once printed? In principle, the answer is ‘No’. However, some surfaces may require a different grade of foil for longevity or durability of the print eg. grainy leather etc. You can talk to your local foil supplier for suggestions as foils can be made available in many grades depending what surface you intend to print onto. You will find that often, you may even be able to send them a sample of your product for them to test for foil suitability and recommend the correct grade of foil for your needs. We only supply general purpose foils because we do not know what you intend to print onto. Whilst we are experts in our machines we do not claim to be experts on all grades of foils and substrates. If our foil does not work well on your substrate, then you will need to liaise with foil suppliers to address any such issues. If the print does not adhere to you surface, then it is not necessarily the machine that is at fault but the incorrect grade of foil. Can I deboss deep into leather? If your print area is small and you are using a deep etched die, then it will be possible. 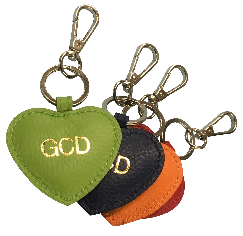 The end result will of course depend on the type of leather you are embossing, temperature, dwell time and the amount of hand pressure applied. The same also applies to other products too. This is a small machine and not a heavy duty machine for deep embossing/debossing or printing large solid areas. Some leathers work well and some may not - we are not experts in leather. 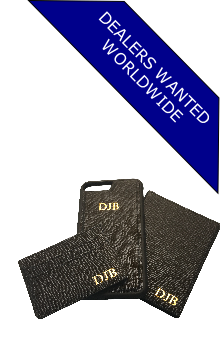 We will however happily test print or deboss onto your leather using our stock dies before you make a purchase - free of charge. We will then send you an image of the print. If you require your items sending back to you for approval, then if you are outside the UK, there will be a shipping charge which can be advised on request. You are also welcome to use your own couriers for collection by prior arrangement. When sending us samples for testing, please send us a generous amount for us to test onto. 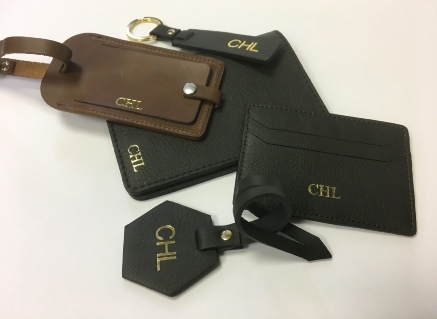 We have many customers who use our machine very successfully to foil print or deboss onto leather but there are always going to be limitations on a small machine in this price bracket. Heavy duty machines which may be able to deep emboss/deboss do cost many thousands of dollars/pounds and this is something one has to weigh up before making a purchase. Just a note - when foil printing onto for example grainy leather, it is best to heat up your die or metal letters and press into the grainy surface without using any foil as this will ‘flatten’ the area and when you do foil print, the foil image will be recessed and not floating on the surface. This will ensure that the foil stays there for a long time (of course using correct grade of foil in the first place). To do this, you must ensure that your product is securely clamped down and will not move on the second or further stampings. Could it be the machine is faulty if I am not achieving a good quality print? Our machine is mostly a mechanical device with a built in thermostat. If the light on the thermostat is clicking on/off and the chase/die holding block is very hot to touch, then in principle, the machine is working and not considered faulty. In order to achieve a good quality print, you MUST read and fully understand the Instruction Manual and watch the Training DVD in full as these contain lots of useful hints and tips. If these are ignored, then this could result in you not using the machine correctly, which in turn could lead to a lot of time wastage for both, you and us. If the machine in genuinely faulty, we will of course always be willing to have it back here subject to our T&C’s. Why are your machines so much cheaper than others on the market? We say, don’t be fooled by the low prices! We have been in the hot foil printing industry for over 30 years and during this time, we have sold 100’s of machines for other manufactures. Because we were not actually manufacturing them, we did not always have control over their design nor pricing. At times, we felt that these machine were rather heavy and somewhat old fashioned. Their prices were often on the high side and could not be justified by a low user or those working on a limited budget. Since its launch in late 2015, the FOILCRAFT machines have broken all sales records in every corner of the globe. We were not overly surprised by this, because we knew that we had on our hands was what the market had been crying out for all along; an affordable, portable and versatile hot foil printing machine, at a quarter the price of its rivals. Need convincing? Click here to see what our customers say in their own words. Please click here to read our Terms & Conditions as well as this Questions and Answers page as they both form our terms of business and sale of goods.